We offer Plastic Clothes Hanger. We bring the varied colors hangers that are very attractive and stylish. These hangers are very easy and light weight. The plastic hangers fabricated by us are tested at each and every stage of developments. We ensure for the durability and finely finishing so that the clothes remain safe. We hae recently developed hanger for jeans. We are offering Bottom Clip Connector to our clients. 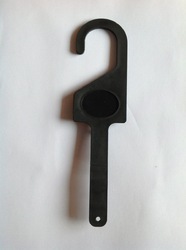 Plastic, Metal, Wooden Hanger . Size: (4" drop) - 8", 10", (9" drop) - 8", 10"
We are a leading provider of Top Bottom Garment Hanger to clients at extremely reasonable market prices. Our superior quality tpt bottom hanger feature an advanced molding technique which makes them virtually unbreakable. These hangers stand apart from the other brands in the markets as they are nicely contoured, shaper styled and space saving. Keeping in mind ever-evolving requirements of our respected clients, we are offering a premium quality range of Baby Bottom Hanger. We are providing our customers superior grade Bottoms Hangers , which are widely appreciated by our customers. 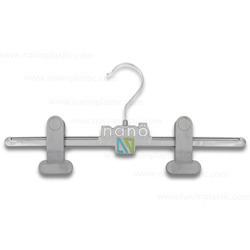 These hangers are manufactured by superior quality material, which ensures its best quality. Our array of Bottoms Hangers are available at affordable rates.